​As kids, my brother and I used to run the streets with the neighborhood kids. We didn’t stay in the house unless we had to; we lived and played outside all day until the porch lights were turned on in the evening – our signal it was time to go home. This was because “nothing good happens after dark” or “if you’re out after dark, you’re up to no good.” I can still hear my mom’s voice of warning, and even recall repeating the same sentiments to my own kids a time or two. Simple statements, yet so full of truth and wisdom. And why is that? Darkness (of night) offers a great place to hide, to disguise the truth, to misguide the eyes. By contrast, light (of day) reveals the truth, it makes things visible, it brings attention to actions. Under the cover of darkness, people do things they would never do in the light of day. Rebel. Our English dictionaries define a rebel as someone who resists authority, control or tradition; but the Greek meaning is much stronger, using words like bold and audacious when describing someone’s acts of rebellion or disobedience. Whichever definition you want to use, one thing is very clear with both: being a rebel is a choice. Today’s pop-culture has made being a rebel a popular label. And in some situations, the rebel has even been the one standing up for what is right. But neither of these scenarios are the type of rebels Job is speaking of. The rebel Job is talking about is someone who knows good from evil yet chooses evil and refuses what is good. And, if we’re honest, that definition makes this scripture very real and personal for most of us. Have you ever known the right thing to do but chose not to do it? Like received too much in change and instead of returning it, chose to keep it. Have you ever known what God said you were to do but chose not to do it? Like been in a situation where you had the perfect verbal comeback, knew you shouldn’t say it but chose to say it. Have you known the Bible teaches not to do that thing but you chose to do it? Like knowing you shouldn’t gossip but that little tid-bit you just found out is just too juicy not to share, so you choose to tell it. I could go on with examples but since I can answer “yes” to each one, I will just stop with these. To be acquainted with the light we must first know who is the light. 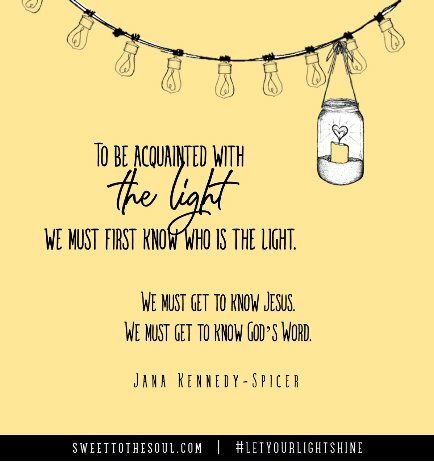 We must get to know Jesus. We must get to know God’s Word. This isn’t simply knowing right from wrong. We can know moral principles without knowing God. This is about being so close in relationship with God that we know Him personally, we know His voice above all others, we know His words over the words of false teachers. The only way we can know for sure if that voice we are hearing is false or if those words we are reading are false – is to know the truth. ​Prayer and Bible study are the best way to know God and to know His words. Then we can then spot what is not of God, we can separate what is false from what is true. We easily recognize the voices of our loved ones, even in a crowd or without physically seeing them because we are familiar with their voice. We are constantly, daily hearing their voice. So if we want to be able to recognize God’s voice above all of the others, we must also be in constant communication with Him. How many times have you worried over a situation because you didn’t’ know what decision to make or which way to go? Me? Too often to count. And in my claim of not hearing from God, I typically go ahead and step out on my own, blazing my own trail. Sounds a little like being a rebel. In Proverbs 3:6, we see that the key, or requirement, for God defining or straightening our paths (making them know to us) is “acknowledging” Him. Other translations put it this way: submit to Him, seek His will, know Him, and consider Him. That sounds like the opposite of rebelling. So my friends, we have a choice. 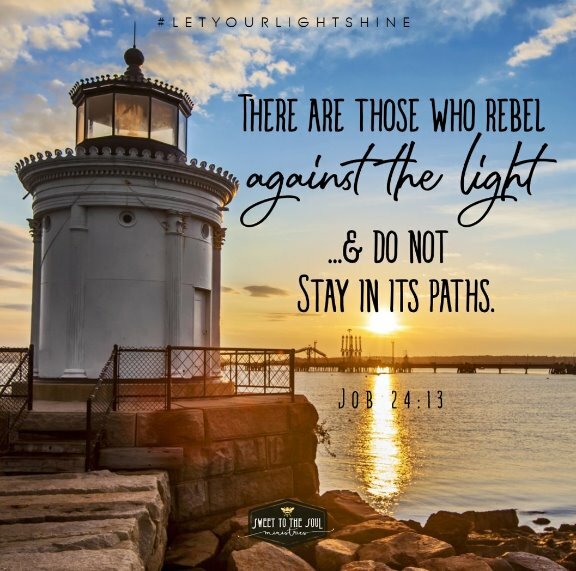 Job tells us that there are those who rebel against the light and do not walk in its path. It’s your choice. It’s my choice. 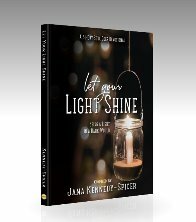 Walk in darkness or walk in the light? Dear Lord, we thank you for your guiding light and the redemption and healing you bring to our sinful lives. Forgive our moments of rebellion, big and small, any rebellion from you is sinful. Oh redeem us and make straight our paths. Show us Lord, the rebellious attitudes in our hearts, reveal to us any area of our lives, actions, thoughts, and words which need to be put off so we can put on the beautiful new life you give. Thank you Lord for answering our prayer. In Jesus’ name, Amen.